Premature Ventricular Contractions refer to the abnormal heart beats that originate in the heartвЂ™s lower pumping ventricles. Premature ventricular contractions are a very common affliction, they occur in the majority of the people at one point or another. They are also known as ventricular complexes, premature beats and extrasystoles. 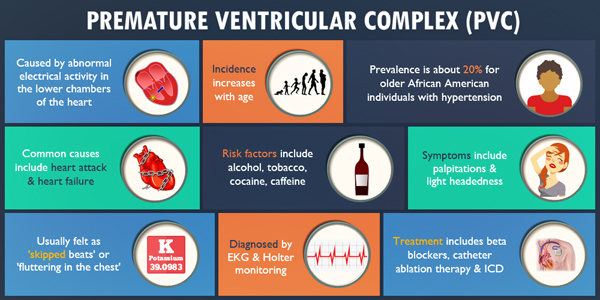 If you suffer from these ventricular complexes from time to time, and have also suffered from some type of heart disease then you must take adequate measures to get this condition treated. Fluttering of the heart beat. Pounding of the heart as it races for oxygen. Missed or skipped heart beats. When you feel any of the above mentioned symptoms it is highly recommended that you go see a doctor. It is important that the main cause behind these symptoms should be identified. 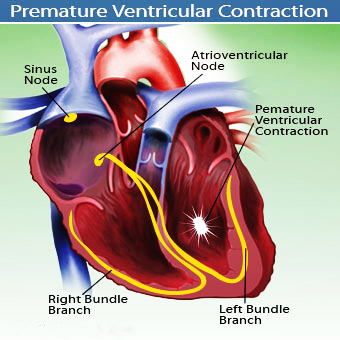 Premature ventricular contractions is just one many problems that could cause this disease. Your heart is composed of four compartments or chambers. There two upper compartments are also referred to as atria while the two lower chambers are referred to as ventricles. The normal beating or rhythm of the heart is maintained by the sinus node. This is an area composed of specialized cells present in the right atrium. The sinus node is responsible for sending electrical impulses down the atria all the way to the ventricles, forcing them to contract and subsequently pump the blood to the lungs and the other parts of the body. These premature contractions originate in the ventricles. These extra contractions usually make the heart beat sooner than the subsequent expected heartbeat. They disrupt the normal pumping routine in the following manner; first they interrupt the regular beating in the atria then the regular beating in the ventricles. These extra, abnormal heart beats make the entire pumping process quite ineffective. Why do these extra heart beats occur? The causes of these extra beats, in most patients are not always so well defined and easy to find. But there are many triggers, diseases related to the heart and abrupt changes in the human body that can cause the cells in the ventricles to become unstable electrically. Electrical impulses may be disrupted or be misrouted dye to an existing heart affliction or scarring. Any hormonal or chemical imbalance in the human body. The use of a specific kind of medications. Excessive use of alcoholic drinks or drugs. High levels of adrenaline in the human body that may be a result of caffeine, anxiety and exercise. When the heart muscle is injured due to a heart disease, it will eventually result in the irregular beating of the heart. There are a number of risk factors or conditions that can increase the risk of abnormal heart beats incredibly. Eliminating the risk factors mentioned below, from your daily life is the best way towards ridding yourself of this disease once and for all. High intake of caffeine, tobacco and alcohol. High amount of exercise without the approval of your physician, especially if you already suffer from certain heart related diseases. Escalated blood pressure also known as hypertension can result in the irregular beating of the heart. Increased anxiety is a common cause of premature ventricular contractions amongst working adults. Underlying heart afflictions, which include several heart diseases, artery diseases, heart failure and attack along with weak heart muscles, can all cause irregular heart beats. People who are young and healthy may not need to fret over this kind of disease, but those that are already suffering from certain heart diseases, or are past their 40s, should consider this disease with great care. Such people, who suffer from recurring abnormal heart beats are at a higher risk of suffering from either heart rhythm problems or weakening of the heart muscle and its related problems. Such contractions can also cause sudden changes in the heart rhythm which could subsequently lead to death. What to expect from making an appointment with the doctor? If you feel like you are suffering from the abnormal heartbeats, you must make an appointment with your family physical. If the condition is too serious then your family doctor is more than likely going to refer to you to a cardiologist. Before you go to see the doctor, there are several things that you must do to facilitate your proper diagnosis. Clearly write down the symptoms that you are suffering from and the duration for which you are suffering from them. Scrutinize long and hard enough on the symptoms from the moment you begin to be affected by them. Keep a journal with you, outlining the detail of your symptoms, in this way none of your symptoms will be neglected when you go see your doctor. This can also help you explain your unusual sensations in chest more accurately. It is your description that will determine the next few steps that the doctors will take in determining your diagnosis. Make another list keeping tabs on the medicines that you have been using. Include every health issue that you have had and the medications that you have been taken to resolve this issue. Enlist the names of all the over the counter medications that you have used to solve those health issues. Enlist any information that you think, might have caused these abnormal heart beats like stresses or recent life changing events. What is the major cause of the symptoms? What method of treatment or approach should be chosen? Is there any modification in the diet that is absolutely necessary? Are there any other lifestyle changes that need to be made to eliminate the symptoms and the risk of suffering from premature ventricular contractions, once and for all? For example, ask if you should drop out caffeine and alcohol from your diet permanently. Is stress causing any of the symptoms? Is there a risk that I might suffer from long term complications? How will my health be monitored over time? Just remember that the doctor is there for your assistance, no matter how embarrassing the question, do not hesitate to ask at all. A momentвЂ™s hesitation could lead to life long suffering. While you wait for a doctorвЂ™s appointment, you should turn your investigative mode on and try to search for facts about your familyвЂ™s medical history. Check thoroughly to see if any of your family members ever suffered from ventricular contractions, stroke or any other heart related disease. Infrequent abnormal contractions are harmless in nature most of the times, but we most certainly cannot rule out the fact that there might be a deeper, more dangerous underlying cause of for these irregular contractions. Knowing your familyвЂ™s medical history will be quite significant when the doctor plans the tests and treatments for you. It might also help the doctor unveil the exact cause of the symptoms. There are different types of electrocardiograms, the different variety depends on the type of fluctuations in the heart beat due to premature ventricular contractions. In a standard ECG, sensors are positioned over the heart or the limbs, data about the electrical impulses is obtained, which is used to make a graphical record of the electrical impulses racing through your body. This test takes a few minutes and is done at the clinic or hospital only. But if your fluctuations in the heart beat are extremely irregular, such that they cannot be mapped out using an ECG, then you may need a portable meter to carry around so that those infrequent heartbeats can also be accounted for and analyzed. There are different types of portable meters, all of them can be carried around in the pocket or strapped onto a belt. When you feel the onslaught of the symptoms you only have to push a button and it starts recording your electrical pulses. In an exercise stress ECG, sensors are attached to a person, and the person is asked to perform simple exercises, like walk on the treadmill or cycle. In this type of tests, if the irregular heartbeats usually disappear after a few minutes, then that is considered to be healthy, if the heart beats become severely irregular, then that is a sure shot indication of something being seriously wrong.